Montgomery Service Leaders gave a combined 2,910 hours of service in 2016-17. Photo courtesy of Jaime Phillips. It’s impossible to quantify the intangible benefits of volunteering, both to those served and those serving. But we can point to the number of people involved in service efforts, the time they devoted to volunteering and the amount of money they donated, and at Dickinson, those numbers underscore a deep and continuing commitment. 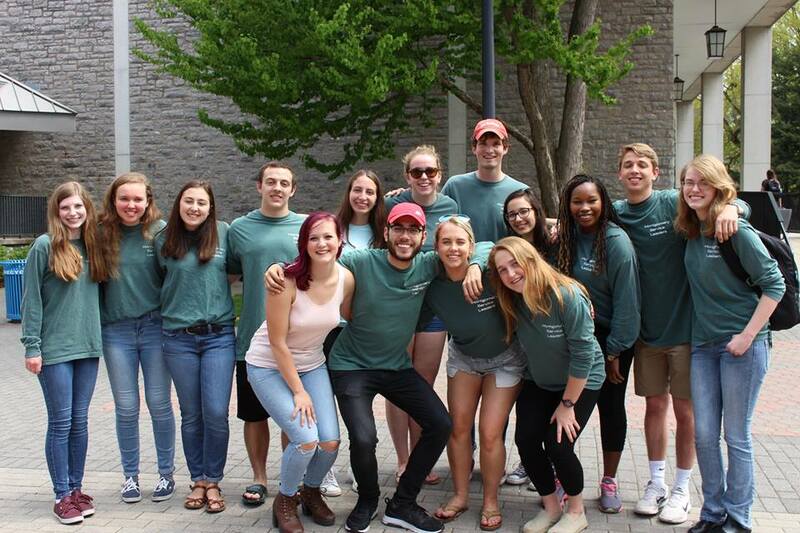 Dickinsonians volunteered an estimated 30,740 hours of community service during the 2016-17 academic year through service trips, CommServ projects, athletics teams, Greek Life events and student-led organizations. Dickinson athletics teams and student groups also raised a combined $87,697 through events such as Relay for Life, Run for Steph and the Run for Hope. The service hours were estimated by club presidents, coaches and coordinators and tallied by Center for Service, Spirituality & Social Justice (CSSS) staff. Together, Dickinson’s CSSS programs (CommServ, Service Trips, Montgomery Service Leaders, Justice is Served, Day of Service and Orientation programming) tallied more than 11,800 service hours during the past academic year, and 485 Dickinsonians volunteered a combined 2,910 service hours to raise funds for the American Cancer Society. Dickinson sororities and fraternities were next in line, with a total of nearly 8,000 hours of community service, and Montgomery Service Leaders and service-trip participants served more than 3,300 hours each. Dickinson athletics teams volunteered about 2,900 hours, followed by Alpha Phi Omega (2,720 hours), Kappa Alpha Theta (2,529 hours) and Delta Nu (2,017 hours). The single event or program attracting the most participants was Orientation First-Year Service Day, which brought all of the newly arrived first-year students together to volunteer at 26 sites in the local community. The top-five fundraisers in 2016-17 were Colleges Against Cancer ($36,263 for American Cancer Society), Delta Nu ($3,418 for Safe Harbour), Kappa Kappa Gamma ($3,400 for Reading is Fundamental and the YWCA), Justice Served ($3,000 for Rise Against Hunger) and Kappa Alpha Theta ($2,247 for Cumberland County Court Appointed Special Advocates). Other organizations served by Dickinson volunteers are Project SHARE, Safe Harbor, Susquehanna Service Dogs, Reading Is Fundamental, the YWCA and MAZON. The spring 2017 service report arrives just weeks after Dickinson was named the first liberal-arts college to join the Engagement Scholarship Consortium, an organization that builds partnerships between higher-education institutions and community organizations. The college also recently received a $650,000 Mellon Foundation grant for civic engagement initiatives. Students interested in getting involved with service programs next year can learn more at the 2017-18 fall and spring Activities Nights and at CommServ Fair.